BRISTOL - Allison and Michael Jessie know tonight is going to be a special one. 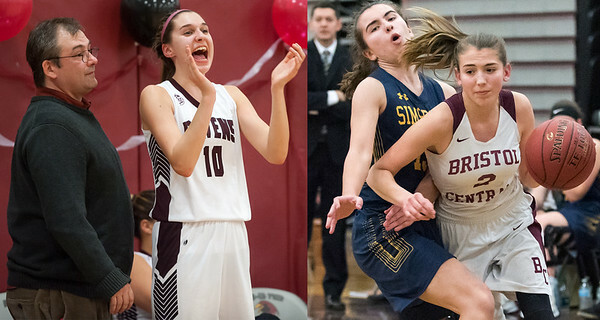 Not only will it be Senior Night for the Bristol Central girls basketball team, where Allison will be recognized along with three of her teammates, but it will be the first time father and daughter will have the chance to compete against one another on the basketball court. Allison plays for the Rams, while her father is the head coach of their opponent, Innovation. The same goes for Allison. It has been a season filled with ups and downs for Bristol Central, which is 3-15. This will be the last time the Rams will be on their home court before closing out their season at Bristol Eastern on Monday. Allison wants to make sure her last time playing in front of the Bristol Central crowd ends in the Rams’ favor. Of course, there has also been plenty of lighthearted banter leading up to the game, both from each other and their respective teams. Allison knows a number of Michael’s players from being around Innovation and the players know what special meaning this has to both involved. “Some insider trading,” Michael joked back. But jokes aside, Michael has seen how far Allison has come as a player and wants her play well. The Ravens head coach, he said, is just happy to be a part of a night like this and expects there to be plenty of emotions along the way. That’s why both are hoping the two teams are playing at their best from the opening tipoff to the final whistle. “We want it to be a fun game where everyone is competing hard,” Allison said. And no matter the final result, both Allison and Michael know this will be a night they won’t soon forget. “I want it to be a last memory for both of us,” Michael said. Posted in The Bristol Press, Bristol Central on Thursday, 7 February 2019 22:03. Updated: Thursday, 7 February 2019 22:06.